While visiting my friends today, I was offered to try some special French alcohol invented in Paris. Feeling very excited about exploring something new, I took a big sip of Suze and......brrrrr It was so bitter! My face expression betrayed me immediately although I tried really hard to stay cool and polite. They all burst out laughing explaining that not everyone likes Suze because of its unique bitter taste. 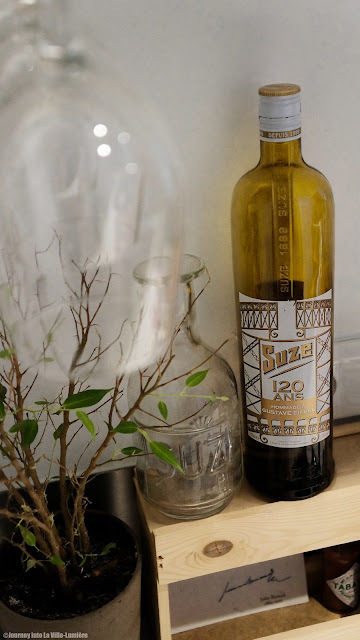 Later, when I was looking for some information about this strangely tasting alcohol I discovered, that Pablo Picasso must have liked Suze very much. Matter of fact, he draw a bottle of Suze in his collage “Verre et bouteille de Suze” (Glass and bottle of Suze).